When you install Petrel for the first time, your machine will register Ocean2013Home at the installed location. Any plugins (including the Petrel Link) that you attempt to install will automatically look for that path. The error message above will appear when the system is unable to find the registered path to write the required files to. 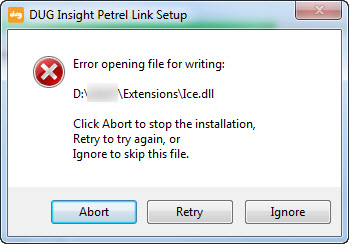 This can occur if you have copied/moved the installed folder to another location or if you have re-installed Petrel at a different path. 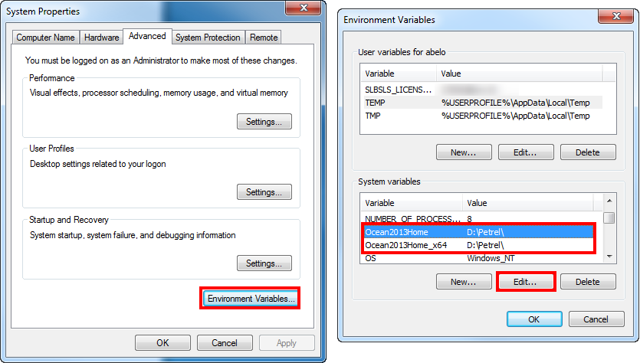 Look for the Ocean2013Home system variables and select Edit. Type the path where Petrel is now located and click OK.
Prev: How do I manually remove the Petrel Link? Next: How do I send horizon attributes / amplitude extractions to Petrel?